Tim and Gabbi, the couple heading up Transformation Paraguay, invited us the first Sunday to their church, a beautiful small traditional chapel close by. Mike told me they were Catholic so we were expecting a short mass. The atmosphere was quiet and peaceful, just a handful of wooden benches with a centre aisle. We arrived early and the priest was praying for requests. He was wearing a regular shirt. When it was time for church to start the priest takes his guitar and starts to sing songs, there was also a piano and another girl singing and playing the guitar. It was very nice. Then the priest preached a sermon and engaged the congregation in answering questions he proposed to them. There was great interaction and his word was interesting and relevant. Not at all what we expected! I was thinking, these Paraguayan priests are really contemporary. Towards the end of the service Mike noticed a ring on his finger. Wow! Do the catholics in Paraguay allow their priests to marry too? Came to find out it was an evangelistic pastor and they had bought this old church a few years ago. We all had a good laugh. The next Sunday we went to the largest church in the city. A stadium style church that probably sits at least 6,000. Three huge screens behind the worship team, the service is televised and three services every weekend. Talk about one extreme to another! Each were really good in their own way. The third Sunday we went to a Mennonite church with Pietro, another member of the Transformation team. Pietro is half German and half Italian, married to a Paraguayan woman. This church was founded by Mennonites and seats around 200 people. They had good worship and even had drums! The people were very warm and friendly. After the service they baptized 14 young people. 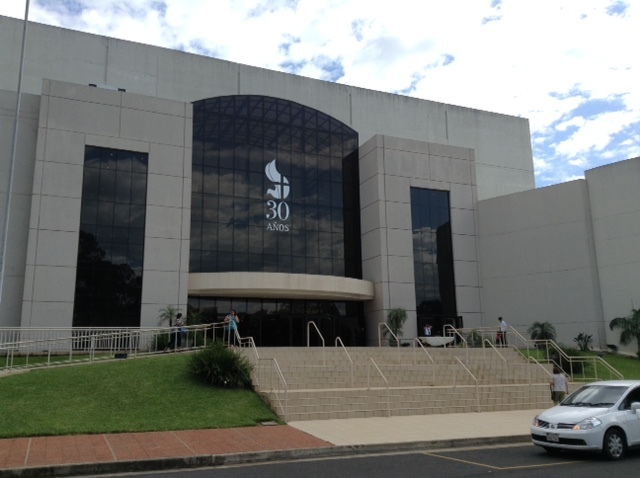 The Mennonites came to Paraguay from Russia, Germany, Holland, Canada and the U.S. Apparently the Canadian Government in the 1800’s would not let them have their own schools so they kept moving, south to Mexico, Central America and South America, wherever they had the freedom to live the way they wanted to. 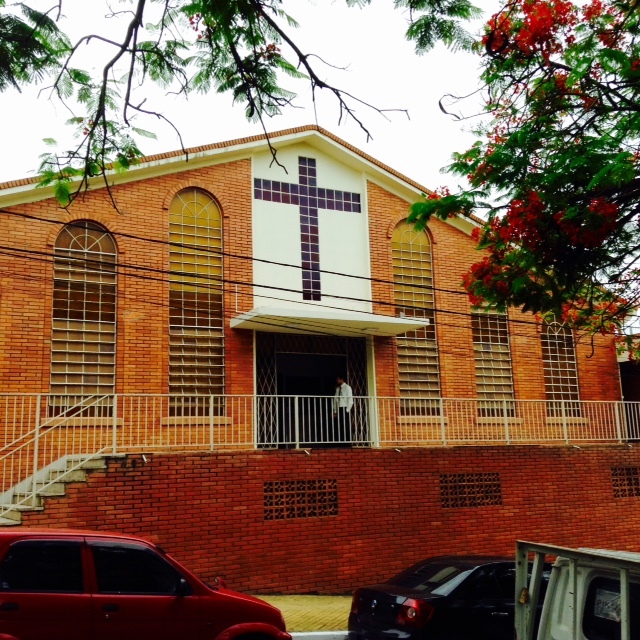 There are many Mennonite colonies, mainly in the countryside of Paraguay. They have helped the Paraguayan people form co-ops and offer micro finances to start businesses. They have a reputation for being honest, hard-working and successful in business. When a Mennonite couple gets married the community buys them a plot of land, and up until the last 20 years or so, if someone married a Paraguayan they would not receive this benefit. On Saturday we traveled a couple of hours outside the city for Mike to meet with businessmen and pastors representing that area. We passed groves of Eucalyptus trees and many hard red dirt mounds of termites. Cars were constantly passing the trucks and busses and slower cars, Mike had to be ready to slow down at a moments notice when a car was coming straight at us on our side of the road. Not for the faint of heart! About half way there we joined a lot of cars that w ere pulled over to the side of the road. 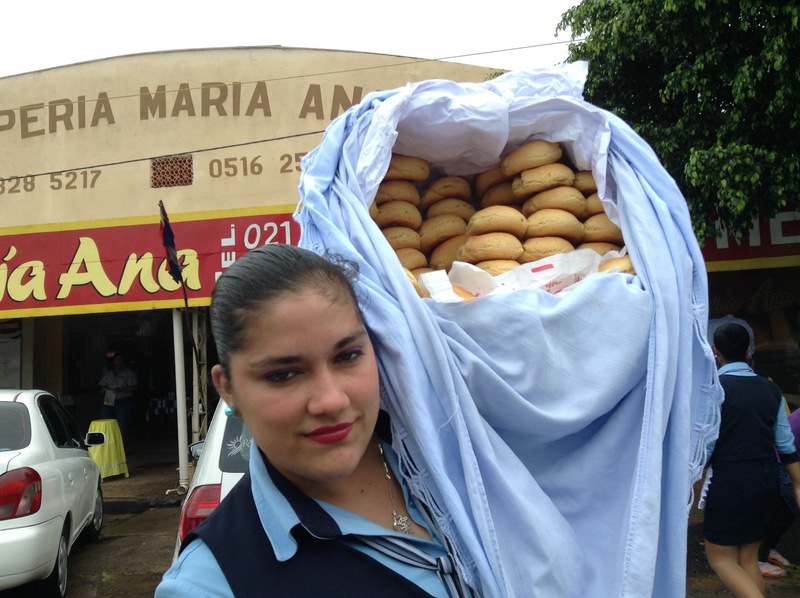 Women with large straw baskets piled high were coming around to each car selling warm Chipas fresh from the oven – a dense, dry type of biscuit shaped like a bagel made from yucca flour and corn flour. This is what everyone eats for breakfast, and after eating one of these you don’t have to eat for the rest of the day, I’m sure it expands in your stomach! The left over Chipas could be used the next day as door stoppers or pucks 🙂 A lot of things are made from yucca and corn, no corn tortillas though or frijoles like Mexico and no hot sauce! Not even any chilis in the store to make it! We’re missing our hot sauce for sure. Then on the way back we stopped at a huge Basilica in the town of Caacupé. 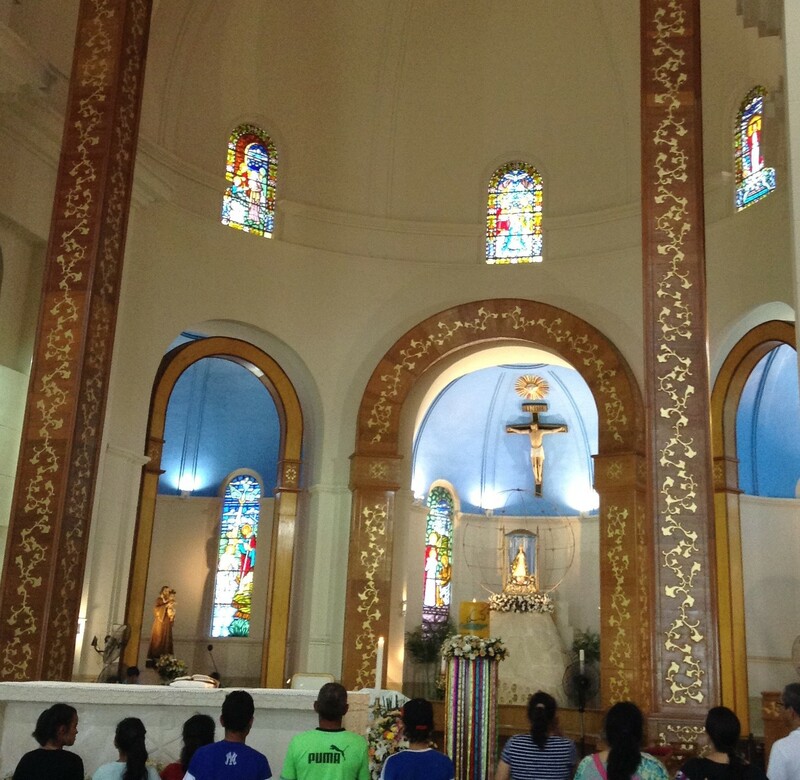 This is a beautiful Catholic Church with stained glass windows. What a contrast to the small humble town that surrounds it! It houses the Virgin of Caacupé and on December 8th there will be the celebration of the Virgin idol which is a 19″ doll with blue eyes and blond hair. 300,000 people will come from all over Paraguay to attend. We saw a lot of people already walking for miles on the road, starting their pilgrimage to the church for this yearly celebration. The Pope was just here in July to visit her. We stayed for part of a mass, there were 4 men who sang and played the harp and guitar. The music was beautiful as it echoed throughout the building. There were prayers and scripture readings. I am open to different styles of worship, some people clap and raise their hands, some don’t, some music is lively and some calming and quiet, some churches are small and intimate, some are enormous, some formal while others relaxed and casual, but the purpose is to introduce us to a personal relationship with God through His son Jesus Christ. This salvation is free, we can’t be good enough, don’t deserve it, and certainly can’t work for it. It is a free gift. When I saw a man coming up the aisle on his knees to pray to the doll, I felt sad. We can talk to God from anywhere, anytime. We don’t need an idol, a priest, a building, or a special day. Somewhere along the line the simple gospel, the free gospel got complicated and it got hard. It shouldn’t be hard.